Fiction – paperback; Faber and Faber; 664 pages; 2012. Translated from the Swedish by Sarah Death. 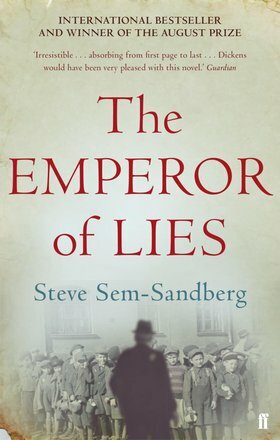 Steve Sem-Sandberg’s The Emperor of Lies won the August Prize — the Swedish equivalent of the Booker Prize — in 2009 and was longlisted for the Independent Foreign Fiction Prize in 2012. It is a dense behemoth of a book, with nary a chink of light in its dark fictionalised account of the Holocaust, but I read it at a time when I was looking for something substantial to get my teeth into. At more than 650 tiny print-filled pages, it certainly fit the bill. It is by no means a light or easy read, but it is one that rewards the patient reader. The book is based on the factual story of Chaim Mordechai Rumkowski, a 63-year-old Jewish businessman, who was the leader of the Jewish ghetto in Łódź. The ghetto — the second largest in Poland — was established by the Nazis in February 1940. Its 200,000 inhabitants were forced to work gruelling hours — and in impoverished conditions marked by constant hunger, cold and fear — to provide supplies for the German military. Chaim, who was also known as “Eldest of the Jews” after the Nazis appointed him to the role, was a mysterious figure with murky morals: was he, as many believed, a Nazi pawn, content to do as the Germans wanted in order to save his own skin and fulfil his quest for power? Or was he acting in the misguided belief that if he turned the ghetto into a well-oiled machine for military production he would not only save the lives of those Jews who worked for him but convince the Third Reich that Jews were not the vermin they were thought to be. In other words, was he a sinner or a saint? The book, which explores this question in exacting, sometimes overwhelming, always meticulous, detail, fictionalises Chaim’s life and the lives of those who lived among him, but it does not provide a definitive answer (although the title might hint at the author’s opinion). What it does is make the reader see the man in all his many facets — some of it good, much of it bad — and leaves you to come to your own conclusions. The problem I have with a book of this nature is not knowing what is real and what is not. If it is based on fact and historical research — and the appendices suggest Sem-Sandberg has devoted considerable time in this pursuit — why not write a straight non-fiction book so it’s perfectly clear? Why fictionalise something and then write it in such a way — very dry, prosaic and “journalistic” — that it reads like authoritative non-fiction reportage? The answer, I suspect, is that the author would find it difficult to bring in the view points of the vast array of characters at the heart of this novel, all of whom were based on real people. (The book is littered with eye witness accounts.) Indeed, there are so many characters that it’s hard to keep track of them (though the guide at the back is helpful), and because it is written from so many perspectives it’s difficult to identify with any one person. I often felt like I’d just got to “know” someone, and then the story switched to a different character and I would have to start afresh, as it were. This might sound like I am being negative, but I have to admit that I found The Emperor of Lies a truly fascinating and absorbing read. It tends to plod along, but I appreciated the detail and the way in which Sem-Sandberg examines Chaim’s moral culpability. It’s crammed with information but is also very nuanced and moving, so that the weight of the emotion builds slowly and by the final page you feel absolutely shattered. When Chaim sacrifices the elderly and the children of the ghetto to save the working population, it comes as quite a shock. And when you know the fate of those that are disappearing — many were murdered in Auschwitz and Chelmo — when they do not, it is extremely distressing. Although The Emperor of Lies is a problematic novel, it is also one of the most powerful I have ever read. You can read more about the real life Chaim Rumkowski on wikipedia (though the articles seems almost as contentious as the person it’s about). And there’s a terrific review — or should I say hatchet job — on the Financial Times website. There’s a more positive take on it in The Independent. It is very dry, but I think if you are in the right mood — I wanted something dark, heavy and important after reading a string of fast-paced thrillers and “fluff” — it’s an absorbing read. I can’t make up my mind about Chaim to be honest. Part of me thinks he just wanted the power (if only so he could carry on his padeophilia from on up high), but another part of me thinks his heart was in the right place even if his actions were misguided. I had to look up the original title — The Poor in Lodz — so I can see what you mean. You’re right the book isn’t all about Rumkowski, but I think he is the central focus because without him these people’s lives would be so much different (ie. that might, in fact, be dead). And yes, it does take time to get into the novel; I found I had to read it in large chunks (ie. a few hours at a time) to become fully submersed in the story. I think that the book was fictionalized so that the author could manipulate the plot. He probably wanted to make some observations of the situation. If he used the non-fiction format, he wouldn’t have had as much freedom to do so.